MyNotes is designed to present facts about people, places, events, and activities related to the Baha’i Faith that may not be known to a wider audience. It’s one way of ‘remembering’, sparking interest until additional information is made available. That presented will require further research to widen the scope of knowledge, cross-referenced and used to encourage a more inclusive rending of Baha’i history. This is a long-term Baha’i History (Historia) project. We continually updated our listings with new information retrieved primarily from the ObesianceBaha archives. Materials and information received from external sources, when presented, will be given proper credit. 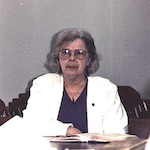 After arriving in Mindoro, Philippines in December 1996, Baha’i Travel-teacher Terry Randolph was taken directly to the San Jose Baha’i’ Center to conduct a Fireside. Before starting, he engaged conversation with several Baha’i friends while waiting for the Baha’i Institute session to end. A young man arrives and states that he is not Baha’i’ but heard of the Faith in Manila, where he currently lives. According to him, he was in Mindoro visiting friends before the start of the Christmas holidays and decided to visit the Baha’i’ Center to learn more about the Faith. Exhibiting an inquiring mind, and having knowledge of various aspects of religious history and spiritual principals, Mr. Ebenezer M. Alvarez participated in lively discussions for approximately two hours. After having all his questions answered, he suddenly decided that he believed in Baha’u’llah’s Teachings, and expressed desire to be officially enrolled as a Baha’i. I first met Jetalyn “Jet” during a trip I made to Shaker Heights (c. 1978) to participate in that community’s Baha’i mass teaching efforts. She was well known for her Baha’i work throughout the Cleveland and Sharker Heights Baha’i communities. Through our follow-on correspondence, she informed me that she would be visiting her sister and family in Frankfurt, Germany and that we could meet once more. At that time (c. 1981) I was living and working in Frankfurt, and we later met over dinner at her sister’s home. Jet Correspondance. Baha’i Faith In Iraq. PDF file includes the 1 Aug 2013 news article ‘Iraq’s Baha’is Continue to Face Persecution, Social Exclusion’, by Ali Mamouri for Al-Monitor: Pulse of the Middle East. Translator: Sami-Joe Abboud. Photographs: House of Bahá’u’lláh in Baghdad, and the NSA of Iraq in 2004. Also included is the 27 June 2013 email from the Universal House of Justice to “All National Spiritual Assemblies” concerning the destruction of the House of Bahá’u’lláh in Baghdad, Iraq. Baha’i Pioneer Training Institute. List of potential Baha’i pioneers who attended the pioneer training sessions held 5-8 June 1980, Foundation Hall, Baha’i House of Worship, Wilmette, IL. Secretary, Regional Baha’i Council of Mindoro. At the behest of the National Spiritual Assembly Eva Balayan arrange, coordinated, and assisted with the Baha’i travel teaching work of Terry Randolph during his stay in Mindoro beginning in December 1996. Her husband, Roger, provided sustained encouragement for this project. Ballard, Doris. For a time we served together on the Baha’i administrative in Washington, DC. She would later serve at the Baha’i World Centre, Hafia, Israel. During the Ten Year Crusade, she pioneered to South Africa, to include Northern Rhodesia, and promoted the Faith in several other countries in Africa. During my travels to South Africa (c. 2003-4) and time spent in Mauritius (c. 2004), she was remembered by some whom I met. I last saw Doris during a visit to a nursing home located in Northern Virginia (c. 2000) where she received much need care. I was able to locate her through information given me by Margret Gowen, a long time Baha’i who lives in Fairfax, Virginia. She apprised me of Doris’s condition and when I went to visit her she did not recognize me, spoke very little, and would respond to questions with a slight nod of her head or with a simple “Yes” or “No”. My visit was short and after saying a prayer I departed. No photos were taken. 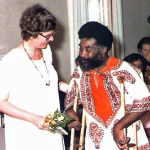 Doris Ballard is mentioned extensively in ‘Heroes and Heroines of the Ten Year Crusade in Southern Africa (2003)’, compiled by Edith Johnson and Lowell Johnson. It’s online but copyright restricted. Access it here: TYCSA. Bright, Eva A.. Member of the Washington, DC Baha’i community, Eva was enrolled on 21 Jun 1966. She then lived at 4040 Livingston Road in the S.E. section of the city. She would later home-front pioneer to Battle Creek, Michigan. She became good friends with Melba Dorsey Wheatley, she also a home-front pioneer and a long-time resident of Battle Creek. They served together as members of the Battle Creek Baha’i community until Eva’s passing (c. 1990). Ref. 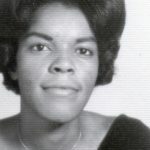 Blog Post: Melba Dorsey Wheatley. Carpio, Altero & Lonnie. 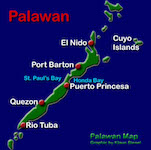 Altero, a member of the Auxiliary Board, together with his wife serve as caretakers of the Múhajir Institute and its properties (Mindoro, Philippines). The Carpio’s have lived at the Institute for 13 years (in 1996), and are largely responsible for its development. Alter Carpio meets his family’s needs through rice production. Acee, their youngest son, lives with them and assist with property maintenance. Reference: Baha’i Travel Teaching Report (Philippines), by Terry Randolph. A link to the report will be placed here when it is finalized. Cummings, Bradshaw. Baha’i Pioneer, Ulan-Ude (a city in East Siberia, Russia). Correspondence & Notes. The pdf file contains (1) Correspondence to “Myra” (no surname given) which discusses the approximately cost for a thirty-day trip by her group to Siberia (undated), and (2) Notes on a talk presented by Mr. Aflatoon Payman on Huqúqu’lláh—The Right of God (30 Jun 1991, Swan Hill, Victoria, Australia). Dahl, Arthur Leon. International Goal Representative, Washington, DC. National Baha’i Review, No. 23, Baha’i Year 126, November 1969, p. 7. Hart, Zeddie. Member, Washington, DC Baha’i community. Seen here at his wedding. NBR: Attends the Baha’i Southern Teaching Conference organized by the Deep South Teaching Committee. He’s on p. 3, third row, first photo (man with crutches), and fourth row, first photo. Burial, Rock Creek Cemetery, Washington, D.C.
National Baha’i Review, No. 23, Baha’i Year 126, November 1969, p. 2. Hayden, Erma Inez Morris. (1911-1994) A music teacher and concert pianist. She was the wife of Poet Laureate, Earl Robert Hayden. Burial: Fairview Cemetery, Ann Arbor, Washtenaw County, Michigan, USA. 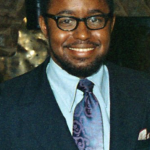 Terry N. Randolph served as a pallbearer. Ref. Find A Grave Mem. ID 104280772. Huddleston, Rouhaniz. Assembly Secretaries. More information forthcoming. National Baha’i Review, No. 21, Baha’i Year 126, September 1969, p. 12. James, Ruth. Educator. Receives honorary state life membership in the Maryland Parents-Teachers Association. She is the wife of Auxiliary Board Member, Albert James. National Baha’i Review, No. 14, Baha’i Year 125, February 1969, p. 5. Jackson, Harold. Educator. The first director of the Louis G. Gregory Baha’i Institute. 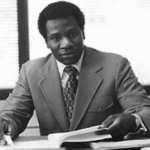 I first met Harold Jackson in 1972 in his office soon after his appointment as director. I was on assignment by the Baha’i Office of Publication to photographically cover of an event being held at the institute. Obituary. National Spiritual Assembly of the Baha’is of the United States, 2013. Johnson, Norbert. Baha’i youth from Baltimore, Maryland. Along with his father and brother, he was a frequent visitor to the Sunday morning meetings at the Washington Baha’i Center. He’s seen positioned at center-photo with a big smile and raised hand. During his extensive travels throughout Asia, Norbert on one occasion visited Seoul, Korea where he had a brief stay-over with me at my apartment in Hannon Heights. Ca. 1987. National Baha’i Review. No. 22, Baha’i Year 126, October 1969, p. 13. Kellogg Foundation Grant. The Baha’i inspired Healing Racism & Healing Our Nation Program. *Ref. Email dated 16 Jun 2018. Irene Atkinson, member, Kalamazoo Baha’i community. Khadem, Javidukht. 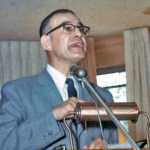 International Baha’i pioneer, later Auxiliary Board Member. At the Monterey Peninsula Youth Conference taught classes on the historical progress of the Baha’i Faith. Wife of Hand of the Cause, Z. Khadem. National Baha’i Review. No. 22, Baha’i Year 126, October 1969, p. 11. Mbatha, Siphiwe ‘Black Son’. 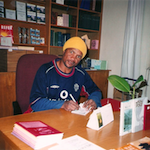 Librarian, Baha’i National Centre, Houghton, Johannesburg, Republic of South Africa (2003). We briefly discussed the expansion of the Baha’i Faith in post-apartheid South Africa and the hopes and aspiration of the Baha’i community to instill new norms in the country. Baha’i National Centre. This links to photos of the ‘old’ Baha’i National Centre and the website showing its current location. McCants, Jane. Served the Baha’i Faith in a variety of positions and capacities. More information forthcoming, especially about her visits to Washington, DC. National Baha’i Review, No. 23, Baha’i Year 126, November 1969, p. 3. McClain, Moses & Eugenia. Husband and wife team who served the Baha’i Faith in Washington, DC. By their estimation through their teaching efforts approximately twenty-two individuals joined the Baha’i Faith. Moses R. McClain (Born: 31 Aug 1906 – Died: 1 Dec 1995). Eugenia McClain (Born: 17 Oct 1905 – Died: 17 May 1995). Burial: Gate of Heaven Cemetery, Georga Avenue & Aspen Hill Road, Montgomery County, Maryland. They were buried one on top of the other in an unmarked grave. Directions: From the cemetery office turn right on to St. Peter’s Ave. and continue on to St. Dominic’s Ave. to where it intersects with St. Gabriel’s Ave. Stop, face East and walk in. Location: Behind the “Damon” black grave marker, and to the right of ground-level “Charles B. Cleveland” bronze grave marker. Section: 15-3, Lot: 380, Site: 5. Due to failing eyesight, Ruth often asked Baha’i friends to read the Writings to her. 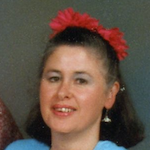 One very young lady, Sharon Luketille (sp), would often volunteer. Ruth often recited Baha’i prayers and Writings she had committed to memory. 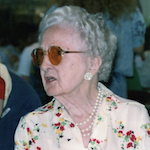 Photo: Ruth at the Ayyám-i-Há celebration (c. 1995), Louhelen Baha’i School, Davison, MI USA. *Conversations of Ruth Mclaughlin with Terry N. Randolph, 1992-1996, Battle Creek, MI and Kalamazoo, MI. “Ruth Mclaughlin lived to age 103 in assisted living here [Kalamazoo, Michigan] and is buried in Mt. Everest Cemetery [Mount Ever-Rest Memorial Park South], Kalamazoo, where her husband is buried. She founded the Baha’i community in Kalamazoo in 1940.” Ref. Email dated 16 Jun 2018. Irene Atkinson, member, Kalamazoo Baha’i community. Ref. Find A Grave. Note name spelled: “Ruth E McGlocklin”. Myers, Jr., Fred. From engineering to Life Insurance Agent. Seen here at his office in Columbia, Maryland. We served together on the State Goals Committee. National Baha’i Review, No. 14, Baha’i Year 25, February 1969, p. 11. Maryland/DC, Secretary, State Goals Committee. 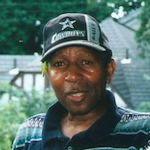 Mr. Fred Myers, Jr., 5029a Green Mountain Circle, Columbia 21043. National Baha’i Review, No. 8, Baha’i Year 125, August 1968, p. 6. Poor Peoples Campaign, Washington, D.C., Baha’i Participation, 19 June 1968. Participants are identified in a slide presentation. See below NBR for the published photo; website post: Poor Peoples Campaign. Poynter, Cynthia. International Youth Project to the Yucatan. Cynthia, a member of the Washington, DC Baha’i community, is one of several participants. A photo included in the reference. National Baha’i Review, No. 22, Baha’i Year 126, October 1969, p.2. Regional Baha’i Council Accomplishment Report (22 Jul 2002) Activities being held in the area of Tagpait, Aborlan, Palawan from July to September, 2001. Shafer, Patricia “Pat”. (1937-2010). Further research is required to determine where and exactly when she became a member of the Baha’i. We met some time after my 21 December 1991 arrival in Battle Creek, Michigan. During our subsequent conversations, she mentioned previously living for a time on the South side of Chicago, IL before later moving to Michigan. She was strong, dedicated, and committed to her Baha’i work and took up the challenging opportunity to home-front pioneer in Three Rivers, Michigan. She was one of my main consultation partners to find effective ways to teach the Baha’i Faith in Michigan and organize the means necessary to consolidate local Baha’i communities. Photo: Healing Racism Meeting, Kellogg Foundation, Battle Creek, MI (c. 1992) Correspondance. For additional information: Find A Grave. Smith, Artenia Gipson. Enrolled as a member of the Baha’i Faith on 18 Jan 1964 in Washington, DC. Address: 20, 50th St., NE, Washington, DC 20019. Husband: Clarence Smith, Son: Guy Smith. She is the sister of Universal House of Justice member, Amoz Gipson. Their son, Guy Smith, married Peggy Rusk, the daughter of the U.S. Secretary of State, Dean Rusk. All were in attendance at Artenia’s funeral , including a bodyguard, in August 1968. However, her brother, Amoz, was unable to attend but sent his condolence. Funeral services officiated by Terry Randolph, Chairman, Local Spiritual Assembly of the Baha’is of Washington, DC. Stewart, Frank. Graphic Arts Design. Offers his services to the Baha’i community with plans and ideas for Baha’i displays, proclamation efforts, and exhibits. During my journey to Myanamar (Burma) in 1987, many Baha’is whom I met had fond rememberances of his visit (c. 1975). Address: 7103 Hickory Hill Road, Falls Church, VA 22042. Tel. 703-534-3760. National Baha’i Review, No. 13, Baha’i Year 125, January 1969, p. 11. Frank Stewart was well-known in the Washington, DC/Northern Virginia area as an avid Baha’i teacher and Baha’i community worker. He had formed a close friendship with an Auxiliary Board Member in Burma (Myanmar) which I learned about during my travels in that country, c. 1987. Additional research required to make available details about his experiences as a Baha’i. Towfiq, Farkhandeh Garzzal. 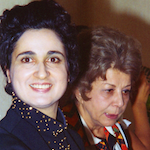 Garzzal (face-front in photo), as she liked to be called, was a well-known member of the Washington, DC Baha’i community. Arriving ca. 1967, she took up residence at 1426 21st (Hartnett Hall) in the NW section of the city. Some years later she served at the Baha’i National Center in Evanston, Illinois, and also at the Baha’i House Worship in Wilmette, Illinois. 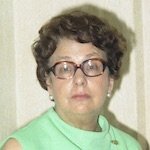 At her passing, the NSA wrote a moving obituary recognizing her service to the Baha’i Faith. Garzzal was fluent in Farsi, Arabic, and English. During her time in Washington she displayed a very pleasing and outgoing personality accompanied with spiritual insight and consummate wisdom. These qualities would serve her well at both local and national Baha’i levels. A divorcee, she had two daughters (surname “Najmi”?) who lived in Macau*. I met and had a brief conversation with them during one of my trips to the colony (c. 1986-88). At some point, Garzzal was reunited with her mother and brother, Cyrus Towfiq, when they arrived in the area; he employed as an economist at the World Bank, and previously worked at the Bank of Mauritius, Port Louis, Mauritius. Also with them was Garzzal’s nephew, then a teenager. All family members participated in area Baha’i activities. *In 1986 Macau was still officially administered as Portuguese territory (colony), having been so since 1887. This changed in 1999 when the Portuguese handed Macau over to China. It then became officially designated as a ‘Special Administrative Region (SAR)’ of the People’s Republic of China. Washington, Theodies. Served on Washington, DC Local Spiritual Assembly, and several years as Chairman. Later became a home-front pioneer to Silver Springs, Maryland. National Baha’i Review, No. 8, Baha’i Year 125, August 1968, p. 4. The National Human Rights Awards Banquet sponsored by the National Baha’i Office of Human Rights (NABOHR) is assisted by the Spiritual Assembly of the Baha’is of Washington, D.C. through its appointed Coordinator, Mr. Theodies Washington. National Baha’i Review, No. 11, Baha’i Year 125, November 1968, p. 6. Weiner, Harvey. Long-serving Baha’i from Alexandria, Virginia. A Baha’i travel teacher, he traveled far to support Baha’i community consolidation efforts and was a frequent visitor to the Washington DC Baha’i community. More information to be provided. Woodson, Gloria. 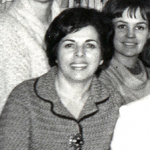 During the 1960s Gloria was a member of the Washington, DC Baha’i community, and served as a Caretaker at the Washington Baha’i Center. She later left Washington to serve as secretary for the Public Information Department at the National Baha’i Center, Wilmette, IL. Xerox Corporation. Xerox Corporation to receive the Louis G. Gregory Award. National Baha’i Review, No. 12, Baha’i Year 125, December 1968, p.3. Xerox Corporation receives the Louis G. Gregory Award, Hilton Hotel, Washington, D.C., December 10, 1969. National Baha’i Review, No. 14, Baha’i Year 125, February 1969, p. 10. Information presented in MyNotes is taken from journals, notes, and documents kept by the author since 1965 and include photographs taken by him during the same period. That presented, when possible, is augmented by research and documentation; however records of conversations that took place must be taken at face value. 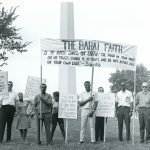 Much attention is given to the Baha’i community in Washington, DC because that’s where the author spent a great deal of time between 1965 and 1980. But this period also included extensive and often extended national and international travels, largely Baha’i related and documented.